Home Business fact SEO Is it true that online businesses should be as SEO experts? Is it true that online businesses should be as SEO experts? 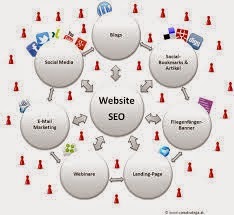 Online business is always associated with the name of SEO (search engine optimization). Some of my friends had studied hard about online business SEO, even to buy an expensive ebook about SEO. Then the question arises, is it true that online businesses need to understand about SEO or SEO experts should look like? I've read several articles related to online business and internet marketing. There mentioned that SEO is a marketing technique that most elite, I do not understand what the elite. Indeed, SEO is very useful because it can deliver a business website to the main page of the Google search results. If it were so, of course, the website visitor and the more likely the customer will be more also. But in my opinion, SEO is not the only way to sell or market your business on the internet. There are a lot of internet media that we can use to sell a product or a business we want to be marketed. The media is certainly paid, but if we can use the results to be much larger than the capital that we spend to advertise. So what will we use to start? This is an advertising medium that is owned by Google. Through Google Adwords we can reach Internet users with a variety of interests in accordance with the target market we want. Google Adwords has a lot of publishers from around the world, the advertiser ads will appear on the publisher's website earlier, in accordance with certain keywords in the web content according to the publisher. Google Adwords ad also appears in the Google search engine. Every time Internet users find information on a particular topic on Google, it will display ads according to keywords typed on Google. Well this is a potential source of traffic, potential buyers who are looking for a product or information they need. Facebook is one of the largest social media today throughout the world. Active Facebook users very much. Facebook Party provides an opportunity for entrepreneurs to market your product or business on Facebook, so Facebook users can see ads there. Facebook Ads and Google Adwords course somewhat different, both of these services have their advantages and disadvantages of each. But Facebook has certain advantages that users are very active on Facebook, so if they like an advertisement they will likely split or notify the advertisement to his friend on Facebook. This will make the ad becomes viral and seen everywhere. Well, of course these two services we can conclude that it is not always berbisni online about SEO. There are many other media that can be utilized. However, as an online business is also a good idea to learn about SEO for your business website rank on Google.